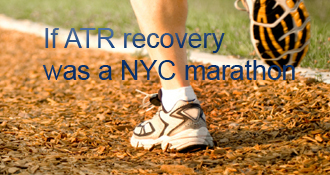 squashedat has completed the grueling 26.2 ATR miles to full recovery! 7 weeks post op….Past NWB, PWB, FWB….Now what? 5 weeks Post Op…..FWB, well almost! Can’t believe it’s been more than 12 weeks since my surgery…..it’s been a long road in many respects and am grateful for the help, encouragement and support from so many quarters - my family and friends, my OS, PT and the folks on this blog, without whom this journey would have been so much more difficult. It’s good to be walking around the house, the office and most safe indoor places without the boot….The use of boot over the last week is now restricted primarily to crowded areas (Mall, Grocery stores, soccer fields, etc and that too more precautionary than necessity)and am hoping to get rid of it totally over the next week or two as I feel more comfortable in those situations. PT has been going quite well….pretty much doing the standard drills that everyone talks about, ROM is almost back and similar to the other leg, balance and weight bearing is getting better and strengthening has a long way to go but improving daily. Biking every day, haven’t started running yet but have been asked to try and take larger steps and try walking faster before we move to the running stage. Gait has almost come back, seems to be better in the mornings but a noticeable limp returns as the day goes by. The one thing that I have noticed now is that by the end of the day (may be because I am on my feet more often or it’s because of no boot) my foot tends to be quite swollen around the tendon and seems tired……Seems to be fine after elevation, ice and a good nights rest. My PT tells me that this may go on and reduce over the next 2-3 months, but is not a big deal. Anyone else experience that? Any suggestions that may help? The wound has also healed and for the most part the scar seems normal, except for some areas closer to the heel that are "fluffed" up (Barely). I was asked to use Mederma (sp? )….any suggestions/thoughts from those with similar experience? Is there a real need? Being able to drive….wow!, just so liberating….am enjoying it so much more now than I ever did. Upon reflection, have come to realize that there are so many activities in our daily lives we take for granted until they are suddenly taken away and it feels good to be consciously enjoying them now that they are back. Overall happy with the progress and am just glad to being able to feel normal again and am consciously trying to enjoy every minute of it. The last two weeks have flown by…..and the recovery has been progressing slowly but very well. The wound seems to be completely healed, but from time to time I can feel a slight stretch pain on it. It comes and goes and am assuming that, that is to be expected with increasing PT. It’s almost as if many of the old aches and pains that were prominent early in the recovery can be re-felt deep in the area after some PT and seem to go away with icing. I also can sense and feel some swelling on some days if I have been on my feet a lot and icing and elevation usually takes care of that as well. PT has been progressing again slowly, but well. I am supposed to see her 2x/week and am supposed to work at the home at least 1x/day and preferably 2x/day. Most days I have managed to do it 2x/day, but it puts a dent in terms of the time it takes away from other stuff, but figured I need to do this at least till I get to a point where I am in 2 shoes. Anybody know if 2x/day vs 1x/day makes a big difference in the short term? Also per the PT, until week 12, she will focus primarily on the ROM and increasing the flexibility/balance/weight bearing capacity etc of the AT and the foot. We are doing some calf strengthening work with the Thera-bands and weight bearing, but it’s limited as they feel that the AT is not completely healed until week 12 (Makes sense as it seems to corresponds with data that the risk of re-ruptures falls dramatically after week 12). The goal again for now is to be in 2 shoes in 2 more weeks so I am spending more time walking (limping actually) in 2 shoes at home. I have specifically been asked to not climb stairs or do a push-off the injured leg. Has that been the typical experience for all? Thoughts? Suggestions? Some lessons learned: My doc never gave me any instructions for removing the wedges (2 ) in the boot and at the first meeting with the PT, she was surprised that I still had them in there. We were able to get rid of both of them within a week and it was painless, but I felt that this could have been pushed with the OS at week 6 and may have helped with less rigidity of the AT at time of the first PT. May not be an issue in the long run, but I feel that to some extent I wish I had pushed my OS a little in terms of moving things along a little faster. The flip side of it has been that, the slower approach has resulted in a relatively smooth and pain-free recovery and for that I am grateful. Enjoyed some joyous emotional milestones along the way….eg. getting into two shoes and then taking unassisted steps in them….getting into the shower and realizing, I can stand up and have my first standing shower in 3 months……driving a car…….sleeping without a boot……walking around the house without the boot……..I think in terms of an emotional roller coaster, these last two weeks were definitely a great high and a realization of the immense healing power of the body. The last couple of weeks felt like a long plateau and am glad now that things are starting to get more active. Met with the doctor for my 8 week. All looks good, the wound is pretty much healed and sealed and he was happy to see that. Felt that the strength was less than what he’d liked to have seen, but that is to be expected after 10 weeks of no movement in that area. He has asked me to work with my physio (2 x weekly) to gradually get rid of the boot over the next 4 weeks though he is ok with me sleeping without the boot and as for driving, he left it up to the PT to figure out when I can do that as well. So in short, the ball seems to be now in the PT’s court which makes sense and I don’t need to see the doc for another 8 weeks, unless, as he mentioned, the pain and swelling got real bad and got worse over time(weeks not days). Fortunately, was able to get an appointment to see my PT the very next day and again on Friday and was glad to get that process underway….it felt good to get some blood flowing in there and get those muscles moving again. Started with some basic movements DF, PF, Side to Side, Circles, Calf strengthening with Bands and very light stretches (she really didn’t want me to push this too much)…the initial movements were slow and minimal, but with time and reps, it was amazing to see the muscle memory kick in. We also got rid of one of my wedges in the boot so that should help going forward as well. Hoping to work it 2x/day from here on out and my PT felt like I should be in a good position to drive short distances starting end of next week…..can’t wait!!! Light at the end of that driving tunnel. I am ok with the gradual transition to two shoes as opposed to a quick switch and don’t mind the 4 weeks there and am thrilled about sleeping without a boot but also find that a little disconcerting. I am a little concerned about hurting my self trying to push the sheets/comforter around while sleeping, especially given that my PT was pretty clear about not stretching the Achilles too much. Any suggestions/advise on this as I do tend to move around in my sleep and am usually a deep, unaware sleeper? Would love to hear some suggestions/ideas, and will also need to follow-up with PT on this. For now, I am continuing to sleep with the boot since I am already used to it. All in all looking forward, excited but anxious, to this new phase of increasing flexibility, strength and mobility. Five weeks back the OS, at my 2 wk post op appt., left me with simple instructions: "Come back and see me in 6 weeks in your boot but leave the crutches at home", Huh?! WTF….thanks to the folks on this blog and just instincts, listening to the body….pushing the envelope, incrementally, but cautiously, ….it’s good to be totally FWB. The transition over the last couple of weeks was gradual, even though I was able to go FWB a couple of weeks back, I could feel slight heel and shin pain some days and when that happened, would spend the next day sharing the load with 1 crutch and resting. Also early on used a crutch when I was outside, as walking on uneven surfaces, up a slope, etc did not feel comfortable…..however, the last few days to a week have been truly FWB and I am glad I took it slowly….the pain for most part is gone, leg feels strong and comfortable….barring some occasional zingers that seem to come and go, though, some of them were quite painful, but the worst of it all lasted about half a day and with some rest seemed to go away. I was also asked about 10 days back to start doing 3x/day 20-30 reps of Plantar Flexion(PF) and Dorsi Flexion (DF) in response to some muscle spasm that seemed to originate on the bottom of my leg and travel up to the calf…I had a severe case of Plantar Fascia a couple of years back and felt like those muscles were tightening up and may have been causing those spasms. It helped a lot and am glad that’s behind me, as I was a little worried about it for a day or so. So all in all am thankful for the steady progress and it feels great to be able to help around the house, do the basic stuff that just a few weeks back was a heavy burden on the rest of the family……especially my wife….who has been a trooper all this while juggling a myriad of things and the kids, initially at home and now over the last few days with driving everyone around, and so DRIVING is now a dire necessity for me. Work is in full swing and I need to be places, the kids are back in school, extracurricular activities are in full swing and my wife is the only one who can drive and it doesn’t help when she is battling a bad cold….. In retrospect, I wish I had gone ahead and figured out a way to use my left foot to drive…I had evaluated a contraption that allows you to do it, but it was two weeks back and was quite expensive and I did not see myself needing or finding it useful for more than a week or two…..at most…..but in hindsight may have been worth looking into this very early on…..Oh Well! I guess if this is the only issue I have after 7 weeks, I should be grateful and take it…..this too shall pass! Hopefully soon! So another week bites the dust! The wound seems to have dried and healed pretty well for the most part, except for about 1/2" of area right around the heel which is still scabby. I’ve also just noticed, in that general area, a small black spot surrounded by a dark grey area that feels tender to touch. Not sure what it means, but am going to observe it a couple of days and see if it goes away. Thoughts/Suggestions? The transition from PWB with 2 crutches to FWB is almost complete and was amazing in terms of the speed at which it progresses (I know some didn’t even have a transition ). Within a couple of days of my last post, I was able to walk around with 1 crutch….the key learning for me in that transition(after some frustrating attempts) was that you don’t just start your attempts with one crutch (as I tried), but rather start with 2 crutches and then while carrying them both try to gradually DECREASE the use of the one on the INJURED side (USE the crutch on the NON-INJURED side). I felt that this helped me overcome some mental reservations and build confidence though physically I felt I was quite capable of it. From there on, the transition to 1 crutch was almost immediate, used the same trick and took a few steps by just lifting that one crutch I had……..Oh! what a feeling!! 1. Walking too much early on with 1 or no crutch did result in some heel pain (as well as some occasional pain on the shin) at which point I would back-off and rest or use 2 crutches for longer distances, climbing stairs, etc. 3. While standing with no support, I still feel I am using my uninjured foot to take on a larger share of the load and so am trying to make a conscious effort to address that as well as some back pain during extended periods. I guess the goal over the next few weeks will be to increase the distance/time without crutches while minimizing the pain and improving the balance. Other than that, I am thinking of attempting stair climbing (lifting off on the injured leg) without crutches and may be even an attempt to balance (taking all precautions to arrest a fall) on just the injured leg. Wouldn’t that be total FWB?. Does that make sense? Thoughts? Suggestions? Concerns? With work starting to take off and with after-school activities for kids ramping up, would be nice to know when I could start driving again. I still have 3 weeks before I see the OS and am not sure if I may be allowed to drive with my right leg at that point, given I have not been prescribed any PT yet. I am now starting to research options for driving including using a contraption that was mentioned by ctcbusted (see link http://www.plfa.org/). Anyone in Georgia use this? Is it legal? Safe? Thoughts? Concerns? Suggestions? As I look forward to these and other challenges ahead on this long road, I am thankful for the progress to date (and getting my hands back) and to all on this blog a big THANK YOU for just being there as a sounding board, sharing your stories, your accomplishments, your frustrations, your suggestions, your debates, your cautions and your encouragement. Appreciate it! 4 weeks Post Op…..NWB to PWB to FWB…..It all depends! So another week gone……and what a difference a week can make!!! Looking forward to the new year and wish all of you Good Health, Happiness and Bliss for the new year as well! The recovery process definitely took an upswing this last week both physically and mentally……. The wound, though still scabby, is healing well and the burning pain I had been experiencing last week is almost gone. I have a feeling that it was somehow related to the removal of the calcified deposits around the point at which the AT is attached to the heel bone and it took a long time for it to heal and was quite sensitive to touch from the boot/cast. Also, am a lot more mobile now that I can actually walk quite comfortably with the boot and crutches while completing a normal stride with the boot (Land on the Heel and roll forward to the front). Even got to a point where, without conscious effort, just walked up a couple of steps before realizing what I had done. Since then have now been climbing up the stairs at home at least a couple of times a day and can feel the strength returning to the legs. I did experience some swelling and discomfort one day when I may have pushed it and been on my feet for a little too long……so need to be careful with overdoing it, I guess! Encouraged by all this as well as what others had experienced, a couple of days back I tried to walk around with just one crutch, but that did not come naturally (physically as well as mentally there was too much instability). Also more attempts led to some pain and discomfort in the heel and tendon area. So figured it wasn’t a good time to try and I needed to build up more strength and my guess is that when I am ready, this step too shall come naturally without me even trying…… so for now happy to be on two feet and two crutches and moving about. Mentally too the focus is now shifting from worrying about the leg too much to other stuff that needs to be done both at home and work and there’s a sense of belief that in due time, things will work out as I keep plugging away till I see the OS in 4 weeks. This is my second post (trying to catch-up) to document this journey post an ATR . I plan to post periodically going forward and hope this helps those who stumble upon it. I know the other blogs in here were extremely helpful to me and find myself coming here quite regularly to catch-up on the progress others are making and to learn from their stories. Wish everyone the best for the coming year and a healthy and fast recovery! The first week back from surgery was pretty much a routine of Sleep-leg elevated, Eat and Take Pain Meds (every 4 -6 hrs), watch some TV, a little work and repeat. For most part, I was in a slight state of daze and slept a lot, may be because of the pain meds (Percocet 10mg/325mg). Pain for most part was limited though on most days I could feel the leg get swollen up towards the end of the day or with increased activity. Moved around the house primarily with crutches and in retrospect should have looked into a scooter or an iWalk just so that my hands would be freed up to do stuff. The second week was an eventful one and a mixed one….the early part of this week was joyous with a 50 year birthday and a 20+ year marriage anniversary celebration and a trip to our favorite restaurant and a party at a friends place. Was glad to get out and felt much better about everything and active as I had gradually stopped my pain meds and the swelling had also reduced. Was feeling good about the progress and that’s when it happened!!! I found myself oscillating between extreme pessimism and a sense of hope (primarily by reading blogs) and went through what was a painfully long and depressive day. Next day upon talking to the doctor’s office, I was further assured that I should be ok and they will check me out at my 2 week post op appointment (day after Christmas). However, part of me was still unsure and kept feeling that my splint had become lose from the fall and that it was scraping against my heel and causing some blisters…..It got to a point where the next day I felt a little sick thinking about the blisters and decided (upon some suggestions from fellow bloggers) to call the office again and see if they would check me out before the holidays (rather than wait 3 more days). Fortunately, the PA agreed and asked me to stop by their office for a change of cast. Was not sure if I’d get to see the doc or if they could change this into the 2 week post op appointment, but in anticipation that this could happen, went prepared with my boot. The appointment was quick - the cast was taken off and some of it had broken (from the fall), the Doc was there and he was happy with the progress, the wound had healed well, no swelling, the AT was still intact (what a relief! ), the blisters were missing (later realized that the pain was from the area where the AT was attached to the bone and was internal). Was told that I could go home in a boot and was asked to work myself from PWB to FWB over the next 6 weeks (Yay!) at which point they will prescribe PT. Was also asked to wear a compression sleeve. All in all a great end to an otherwise eventful, stressful week!!! and a sense of progress, graduation to the next level!!! Since then this last week has been quite good, was a little confused about what PWB really meant and figured I’d start with just resting the foot while sitting or standing. Upon calibrating this on a scale it was about 10% of my body weight and felt quite comfortable doing this for 3-4 days gradually increasing the duration. Over the last couple of days, have started taking this one step further by actually walking with both legs and crutches. I usually lead with my booted leg (heels) and the crutches and then bring in the good leg behind to slightly forward, while trying to maintain a normal walk (with evenups). Seems to be working well with some mild shooting pain once in a while that seems to go away on it’s own. Based on my measurements, I am putting in about 20-25% of my body weight on the injured leg doing this and am quite comfortable with it. I also have some knee high compression socks that I use (will switch to compression sleeve once I feel that my foot is not as tender), these feel really good and comfortable. I was also advised to keep my boot on while sleeping, primarily to ensure that I did not accidentally walk off without it. The one area of concern that I now have is the burning sensation of a blister that I felt seems to still be there, albeit milder, and it seems to be directly where I would think the AT was attached…..is this to be expected? How long? I have started icing it and will give it another week for it to heal…..any thoughts? All in all, happy about the progress, relieved about the near-disaster….and some lessons learned…I stopped taking my pain meds cold turkey and in retrospect feel that my depression/pessimism (I am normally quite an optimist) may have been to some extent a withdrawal symptom of the meds. If I had to do it again, I would have reduced the pain meds earlier but more gradually. It was a routine squash game, the weekend before Thanksgiving, Saturday, November 22nd to be precise. We were one point away from wrapping up the game and it’s right then, that it hit me, felt like someone took a hammer and hit me on the back of my heel! Turned around and no one! WTF? That’s right, that’s how I felt at that instant (realized later that this was a common feeling among all those who had been through an ATR). The initial pain was bad, but it seemed to calm down with time. little swollen, but not too bad!…..BUT I could tell that something was not right and that in all likely hood I had torn the dreaded Achilles. Managed to get back home and through the weekend, it was RICE (Rest, Ice, Compression and Elevate) though I found that I was able to limp along for most part without pain, the ankle area did swell after some time of activity. Saw the doc, on the 25th and was advised that surgery was the best option for a quick recovery and ability to get back to an active life style (not sure if a non-surgical plan was even an option and was never discussed). Based on the x-rays they took, he thought that in my case the tendon was intact and that a piece of the bone had chipped off with the tendon on it. I think they call it an Avulsion Fracture. Given family and work conflicts, the date for surgery was set for 12/10 (~2weeks later) giving us an opportunity to wrap up lose ends and be prepared. Also, a bit of information, I was advised that surgery should be done as early as possible after the injury, and definitely no later than 3 weeks. I was also given a boot at this point and asked to use it for extended walking or walking in unfamiliar surroundings (anytime I went out of the home). At home I was pretty much bare foot with minimal pain or swelling, but very limited in my ability to walk much. I also opted not to drive around with an injured leg and play it safe more for others than myself. After about a week of this, was ready for them to get the surgery done so that the focus could shift to the rehab and progress rather than the status quo. The pre-op process and surgery went quite well and I was out of there in less than 5 hours, actually feeling relieved and for most part painless at least on my injured leg. The surgery was done under general anesthesia with a nerve block on the injured leg and the leg was wrapped in a splint. The one thing that bothered me most on gaining consciousness was a pain on my left shoulder (I have a partial rotator cuff tear) for which they gave me some pain killers. I later found out that my arms were in an above the shoulder position throughout the surgery and that may have been the main contributor to my shoulder pain. I wish someone had asked or offered an option on this and am not sure why the arms were not left along the side of the body….. Upon discharge, I was asked to come back and see the OS on 12/26 for a 2 week post op at which time I could be put in a boot and was advised 4 weeks of NWB. In retrospect, I should have seen this coming or should have done some proactive work to address the injury. I say this because over the last year or two, I had pain on my heel(right where the AT is attached) that would show up with excessive use (walking, running, playing, etc). It wasn’t a bad pain - enough to bother me slightly but one that went away quickly upon icing and an anti-inflammatory and there was some evidence of calcification/bone-growth as well. Again noticeable but not enough for me to get it checked out…..
A few regrets that gnaw at you while you go through this….the most obvious one, throwing life into a frenzy for not only me but that of the entire family especially my wife (who was so looking forward to some relaxing holidays and getting stuff done around the house) who had to now work the thanksgiving week so that she could drive my son to Florida for a soccer tournament the week after and then drive back in time for my surgery….to my kids who had to either skip on after-school and other fun activities or find rides to take them around…..Yes painful, but learned quickly that one had to accept it, be thankful for their presence and be patient and let time be the healer as this was just a temporary set-back and it too shall pass. Hey there! Nice to see you today. Almost 13 weeks behind you…YAY you! I agree that the limp is not enough strength in the calf muscle and a still weak tendon (tendon is in the remodeling phase)..after walking or standing for more than a half hour the calf fails so the tendon tries to support us and it gets sore or swollen…or as in your case, you still get a small limp. Seems pretty normal and well reported here. At almost 18 weeks my limp is gone now, it just kind of stopped happening over the last few weeks. I think it’s because I started more calf strengthening exercises since 16 weeks because that was the point at which re-ruptures decrease significantly…I bet as you reach the point where you can really start to build that calf muscle back up your limp will go away too…seems to happen that way for most of us. Thanks all for the comments/encouragement. Donna, sure let us know how the new medicine goes. Beachy, I don’t have a whole lot of pain anywhere, except for the occasional shooting pains. However, with some excessive standing (less than 30 min) or even just being vertical, I can feel my heel area swelling over time and then the shoes/socks start hurting around the tendon area as there’s no room for them to expand. So I can see how 4hrs may be tough on you. You may want to try being in a boot for some of the time to see if if helps. I have now made it a habit, even at work to elevate/ice my feet whenever I can and then again do the same at night. My PT has suggested that I don;t stop the day to day exercise or use as it’s good to stay active at this stage and manage the discomfort/swelling. As for my walk, I still seem to have a slight limp (not enough strength), but seems to be improving and is usually better after my PT when I am not as stiff. 3 months - big milestone! Keep up the hard work! I’ll be 12 weeks on Friday. How does your tendon feel with weight bearing? Any pain with push off? Push off is very painful for me, tried going back to work for 4 hours last week (bartending) and was dying by the end of the 4 hours. Just trying to get a comparison. You seem to be doing very well! At 17 weeks yes. Suggestions? Do things incrementally & continue to RICE as needed. Neither the swelling nor the tiredness is unmanageable. I just can’t do as much as I’d like. Today I really wanted to go for a long walk but after PT the tendon just wasn’t up for it. Some days are better and I try to do more then…on days like today I accept that I can’t. Saw my OS for 16 week follow up and told him I’m still very sensitive along the incision and tendon and that I’m having zips, zaps, and zings with the increased PT I’m now able to do. I also have a small bump on the tendon at the bottom of the incision and a larger one at the top so he’s ordered a compounded medicine that I’ll get in a few days. It’s custom formulated and is applied externally to the tendon. It has 3 medicines in it, one for pain, one for inflammation, and one for scar tissue. I’ll let others know if it’s helpful after I use it. Hey im glad your recovery is going well. I am 14 weeks post op and everyday is still a battle. Patience and not pushing too hard is key, you want to make sure you rest plenty because thats when you recover most. You have to listen to your body and some people recover faster than others so dont feel discouraged when others are moving right a long. I started jogging 1 mile and if im feeling good push it 2 miles everyother day but if my achilles starts giving me any discomfort, I will stop. Again nobody knows your body better than you..not even your pt or os!..listen to your body and dont rush..massage ice and elevate really accelerated my recovery process. Thanks Donna, yes it does help to get an idea of what to look forward to over the next few weeks…..
You couldn’t find my blog because I don’t have one anymore. For personal reasons I had Dennis delete mine about a month ago. Before deleting it I cut and pasted what I did have into a word document and it’s more of a private journal now with lots of other notes and data in it. It fits my style more. I’m enjoying being here with you guys and commenting when it appears helpful, which is more my style. Remember that milestones are personal. It was helpful for me to see other bloggers milestones so I have no problem posting mine in an attempt to be helpful, however, we are all unique individuals so keep that in mind. Mine may not be yours. I know many others were not mine. Thanks you’ll! Donna, yes I always looked at your milestone list as it gave me a 4 week idea of what to expect….for some reason was unable to find it on the site….kept coming up as empty…..is it possible to re-post or attach link here? Thanks! Not sure about the 2x/day vs 1x/day statistically…some days I do one because it’s all I can fit in or physically manage, some days I do two or even three workouts if I have time and feel up to it. I go up and down the stairs quite a bit at home. I go leg over leg on the way up with no problem and then on the wa down i still go 1 step at a time. Haven’t felt any discomfort from that..wonder how it would be a problem though if you’re primarily pushing through heel vs toe, (I am not completely push off balls of feet/toe, mostly heel). Sounds like all is well, awesome! All, thanks for your comments, sorry did not get around to responding earlier….but yes continued to sleep with the boot for some time and then slowly migrated to no boots with pillow for some time now. Ironically, I had better sleep with my boot than I do now without it but I also know that’s just a transitional issue. As for driving, I did contemplate driving with a contraption that makes left footed driving easy, but felt that I may not need it for more than a week and decided against it. As for driving with the left foot, I probably could have done it, but did not want to risk it, especially was concerned about hurting someone else and fortunately had folks to help when needed. Hi…great news…I know you’ve been wanting to drive! Soon it seems. I think the boot is a personal or per doctor protocol thing. Really it’s up to your comfort zone. I didn’t ever sleep with mine.I had the full cast off at 3 weeks and into the boot all the time except for sleeping weeks 3-8. Into two shoes week 7 and have been wearing the boot as needed/ As needed is for long walks or safety. Now I’m at 13 weeks. Yes, don’t stretch too much yet…only to that slight slight point of a pull….over time it will increase on it’s own. This is an exciting period but also will have new challenges. Keep up the good spirits, You’ve got this! I’m also a deep sleeper and I flop around like a fish. I plan to keep my boot on for another few weeks at least while sleeping. It seems to be a very personal thing though, once given the all clear. Folks on here have slept w/out a boot just weeks after surgery. I am considering sleeping with the boot on until I get to the point where I can comfortable DF past zero with some pressure + put some force onto it (walking, walking up hill, jogging, etc). It looks like our paths have realigned somewhat, I too am anxious just to drive..even if it’s just the local coffee shop! The plan here is to get to zero next week I think for a full week then possibly transition into 2 shoes with heel wedges. This is the stage I am most nervous about. CJ81….thanks for the note, will try and provide an update this weekend…good luck to you as well. Rivaridge…..yes I too have a small 1 cm area that’s not closed yet, may need to talk to my OS next week and see what they suggest. And yes, I too had plantar fascitis and figured that that may be the cause….PF/DF 3x/day seemed to help with that….thanks for the note. SquashedAT - I’m just a couple of weeks behind you - 23 days after surgery and have started PWB to FWB over the next couple of weeks. My Dr. also prescribed early PT treatment this week which has helped quite a bit. I was a little skeptical at first but this first week, my ROM has increase 8 degrees in my ankle. I’m not allowed to go past 90 degrees but I can tell a big difference with the movement of my ankle and Achilles. As I am increasing weight on my hurt leg, I feel some of the same sensations that you talk about in your post. I’m also very eager to get back to driving since it would take a load off of others who are doing a great job in taking care of me and driving me to and from work. I appreciate your post - it helps me to know what to expect over the next couple of weeks. Good luck with your recovery! On the suture issue, you should go in and get it looked at. I did the “keep an eye on it” routine for a month and it just would not get better. It was only once I went in and got the fiberwire cut back that it healed. The month of waiting delayed my abilty to really begin pushing myself, as the suture spot hurt and always seemed on the verge of getting infected. Once they cut it back, things improved aslmost immediatly! Not sure about that suture issue but that pain seems to be of the “zings, zags” variety that just kind of happen once more consistent pressure is put on the foot. That was my deal when I was PWB, which I’ll be attempting again next week! Maybe dial it back and ice it a bit today/tonight and ease back into it tomorrow/weekend? All, thanks for the comments suggestions…..and yes slow is good…..
Here’s some quick updates….the black spot with the grey area near the wound seemed to get worse and infected and was draining some puss, so spoke to the doctor’s office and was asked to clean it up and keep it clean and dry. Could be a rejected suture or an infected hair follicle, hmm? Does not seem to have affected the incision but something to keep an eye on. Also, over the last couple of days was walking around crutch-less (and may have done a bit too much or it may be completely unrelated) but since last night started experiencing some occasional pain/spasms that seem to start at the heel and travel up the side of the heel through the tendon up the leg. Seems random but more frequent when the injured leg is on the ground rather than elevated (though have experienced it then as well). It’s a short burst, comes and goes within seconds. Also feel that it’s preceded by an involuntary muscle action around the plantar facia…..any thoughts, suggestions? I’m smiling as I say this…It appears to me that you are at the stage so many of us go through…you are starting to get mobile…it’s exciting after so much sitting around, it’s so freeing, and you want it all back…NOW…ha ha…patients my friend. It will all come. You’ll see how much more you’ll progress just over the next few weeks…I promise you will climb stairs again, balance on that leg, and yes, you will drive…you’ll do it in your own time frame when your body is ready. As soon as you can get around crutch-less, you’re FWB. Shin pain is normal and almost desirable - but you could add padding. Pain under the heel is normal and can be addressed with padding (gel footbed) and exercise (roll over a tennis ball or a frozen water bottle) and rest. Pain behind the heel is a sign to back off until it’s gone, IMO. Otherwise, if it feels OK it’s probably OK, but stay INCEMENTAL. Re. Black spot, could maybe be stitch coming through, normally harmless, sometimes not. Was just discussed a little In beachy12’s blog under “Stitch coming out”. Not too sure bout your protocol but by 8 weeks many of us have just gone into 2 shoes, and within a few days started to drive again. How long would you be using the fancy gadget for? Nice on the one crutch. I’m going to try tomorrow with the help of the PT. When I go to do it myself I stop halfway through..no pain or anything, just unsure. Hopefully the PT will show me how to do it, even though I think I’m doing it right, and that’ll be the little mental edge I need. Also, I’m going to the Patriots/Ravens game Sunday, my ticket rep was kind enough to swap out my regular seats with ADA accessible ones so I’ll be dragging my iWalk with me for that. Hope to see you posting about no crutches soon! YAY! for helpful hints. I just tried Norm’s helpful hint on how to walk down stairs properly by hanging your injured foot off the step a bit…worked like a charm! In case you missed it I answered your question about exercises and driving under comments in the milestones of recovery post I made. Donna, yes spent some trying times using the crutch on the injured side, came to the same realization and that helped speed things along, I think then it was more of a confidence issue after that. Though, there should be a way to capture some simple information like that so someone doesn’t have to learn it through experience…..May be a link on Helpful tips for folks at various stages in their rehab. Eric, good luck with the PT tomorrow! I’m glad we’re all able to tolerate each other…silly grin! FYI on using one crutch (or a cane) when you’re ready…in case you didn’t know, use it on the UNinjured side. I’ve always hated using 1 crutch. After both of my ATRs I did use a cane for a few days, but as much as a Keep Away flag as a PWB support. Then the blessed milestone is when you find yourself puzzled about where you left it! I’m putting probably much more than 50% on my injured leg while using 2 crutches, but like you I had a tough go at the one crutch attempt. I’m going to try again Friday with the PT just to make sure I’m doing it correctly. Been awhile since I experienced a mental block like that. Hello! Good luck in your recovery. I ruptured mine about 5 days after you did yours. I am a little more than 4 weeks post op and have been FWB for 2 weeks now. I also (very occasionally) have a “twinge” near the surgical site that feels a little “hot” like a blister. It doesn’t last long, but I think it’s the same thing you’re feeling? My doc says it is the nerves, etc in the foot firing and blood flow through the area on the skin that makes it feel that way. Was told it is normal and not anything to be concerned about. My doc has me massaging the wound site to break up scar tissue. You may want to ask your doc about doing that if he hasn’t instructed you to do so. Good luck! Haven’t had a burning feeling either time but rest, ice and elevation are typically the best ways to control pain. Lots of nerves and tissues get traumatized bt ATR! Give them a chance to settle down. PWB is often followed by “as tolerated” so monitor your shooting pains. The great part about moving towards FWB is that the chance of tripping is way less- take it easy till you get rid of the crutches. I really enjoyed reading your post, thank you for sharing your experience over this period. In regards to moving from PWB to FWB over the next 6 weeks I’d like to share this… I find that avoiding expectations really helped me…instead of setting goals as to when I’ll be able to do what, I realized that all I really can do is look at what I can do & do that…so now I just wake up each morning see where I am & take it from there until the next day. For example today I saw I can now walk upstairs straight instead of this sideways thing I was doing, so today I’m going up & down the stairs with the intention of going straight now that I know I can. No thoughts on the blister. I can only share I’ve had lots of odd zips, pains, pings, & zaps…now at just about 8 weeks their are fewer & fewer. None were persistent but came & went. squashedat’s AchillesBlog is proudly powered by WordPress and WPDesigner..